Krypton Neon provides an exceptional level of quality and care. Our staff is highly qualified and experienced. We work with cutting edge technology and time tested materials..
Kenny Greenberg trained at the New York Experimental Glass Workshop and founded Krypton Neon in 1981. He has created Neon Scenic Art and Lighting for countless Broadway Stage productions, Feature Films, Television Broadcasts, Museum and Corporate Displays. He consults for corporations and lighting designers and he has written articles for Signs of The Times and Sign Business Magazine. In addition to his skill as a neon glassblower, he designs electronic control circuitry and computer software. 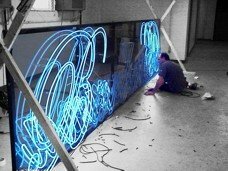 His Interactive Neon Art has been shown in several museums and galleries. He has also created and collaborated on numerous prominent public art installations. Tom Unger joined Krypton in 2002. He is a highly skilled neon glassblower and neon artist. He has worked for five years with one of the world's leading manufacturers of neon materials and equipment. He regularly writes for Sign Business Magazine. He is also a graphics and website designer. Diane Hendry worked in the fashion design industry creating one-of-a-kind clothing for well known celebrities. She is an artist and freelance interior designer. Since 1988 she has brought her skills to Krypton for special design projects.